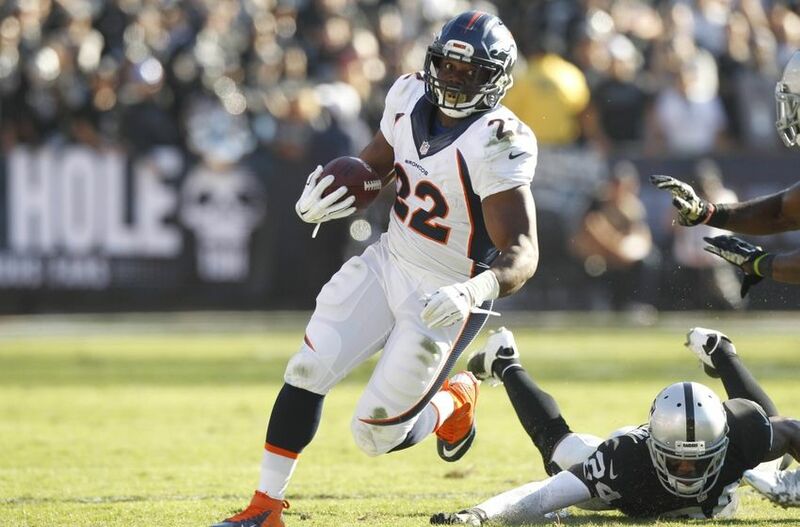 The Denver Broncos have a couple fantastic running backs, but heading into training camp, C.J. Anderson is atop the depth chart. Anderson finished last season with the 11th most points at the running back position, and he looks to continue his success he had last season. Anderson rushed for 849 yards and eight touchdowns in 2014, while snagging 34 balls for 324 yards and two touchdowns. Anderson was Peyton Manning’s main check down receiver, and I look for that to continue into 2015. The Broncos have had one of the most successful offenses over the past three years because of Peyton Manning, so choosing a Bronco on your fantasy team usually isn’t a bad choice. I don’t think Anderson is a first round talent, but, instead, he is more of a late second, early third round selection because the running back position is so highly coveted. The Buffalo Bills acquired running back LeSean McCoy from the Philadelphia Eagles this past offseason for linebacker Kiko Alonso. McCoy led the Eagles in rushing, but he shared a lot of duties with Daren Sproles, who was signed prior to the 2014 season. McCoy was taken out in many situations where he would’ve played in just a year before. This led to a decrease in his fantasy productivity, which frustrated McCoy’s owner. 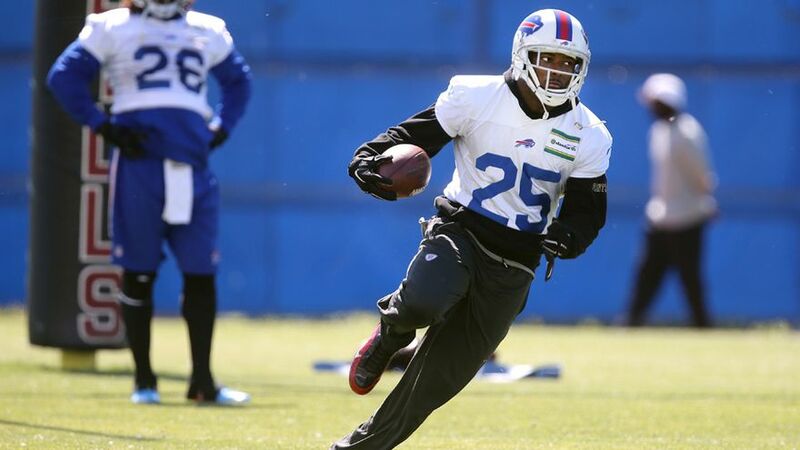 Now, McCoy is the top dog in Buffalo, and he doesn’t look to share duties with anyone. He will be going to a lower ranked offense behind a defensive-minded head coach in Rex Ryan, but McCoy is still the elusive back that we all know and love from Philadelphia. McCoy should see an increase in production in Buffalo. He is going to be able to set the tone for the Bills offense. I also look for the Bills to use McCoy in many second and third down situations to dump the ball to him in the open field with blockers ahead, along with his usual red zone duties. I have McCoy ranked ninth because he was the 13th ranked fantasy running back at the end of the 2014 season. However, He should see an increase in production in Buffalo because he will be the go-to guy coming out of the backfield. I would not draft McCoy in the first round, unless you have a bigger league. He should be taken in the second round, but If he lasts to the third round, you have to pick him up. 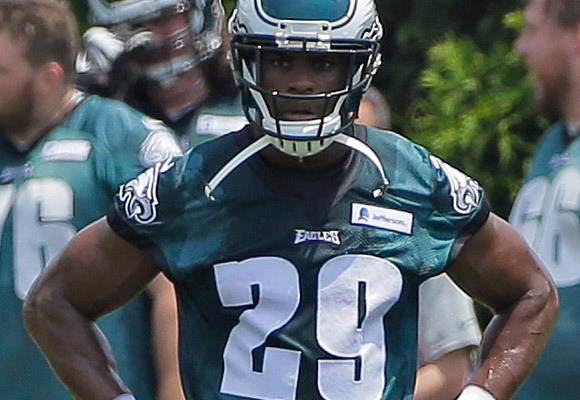 The Philadelphia Eagles landed one of the biggest free agents in 2015 by signing DeMarco Murray from the Dallas Cowboys. The Eagles traded away running back LeSean McCoy before even signing Murray, which had Eagles fans scratching their heads, but now with Murray, they are confident their offense will be better than ever. The Eagles run a fast-paced offense, which causes multiple substitutions per possession. Murray is backed by Ryan Matthews, who was also signed as a free agent. Matthews will see significant time as a backup due to the high octane offense ran under Chip Kelly, which hurts Murray’s fantasy value. In 2014, LeSean McCoy saw a significant decrease in production due to offensive line injuries and sharing carries with Darren Sproles, which I fear will happen to Murray. My biggest concern about Murray heading into 2015 is that he will not get the touches he got in Dallas because of how fast-paced the Eagles offense is. Murray was the top fantasy back in 2015, but I don’t think he will be near the top spot in 2015. Murray will be a first round pick in most drafts, but I would not waste my first round pick on Murray, unless there is not a running ahead of him on my list available. He is a second to third round selection, to me, because he will see a decrease in carries in Philadelphia. The Houston Texans struggled on the offensive side of the ball last year because they had major quarterback issues. They went through three different quarterbacks in 2014, but they finally found a starter in Bryan Hoyer, who they signed this offseason from the Cleveland Browns. This will give Arian Foster some much needed assistance because Hoyer will open up running lanes for Foster by throwing the ball down the field. The Texans maintain possession of the ball frequently because of their stout defense. Their defense gives their offense great field position because of the front seven manned by J.J. Watt, which will increase the touches by Foster. If the Texans want to have success in 2015, they need to stick to the ground game. I think that Bill O’Brien knows this, so I look for Foster to see an increase in his workload. Foster was the fifth most productive fantasy running back in 2014. Foster is mainly a ground and pound type of a guy. Foster only had a little over 300 receiving yards in 2014, but he did have five touchdowns though the air. I think that Foster is going to be a first round pick, but he shouldn’t be anything more than a late first round pick. He should not be a a top five pick, even a top seven pick. If he is available in the second round, I think you should draft him. The Chicago Bears began their offseason by trading away Brandon Marshall to the New York Jets for a fifth round pick in the next year’s draft. This trade was thought to hurt the Bears offense when it first broke, but the Bears fixed all worries when they went out and drafted Kevin White out of West Virginia, who can do similar things that Marshall did. The passing game is going to be the key to Matt Forte’s success because the passing game opens up all running lanes, while a solid ground game open up the passing lanes. These go hand in hand when trying to build a top-notch offense. If White and Alshon Jeffery can spread the field, running lanes will open wide for Forte. 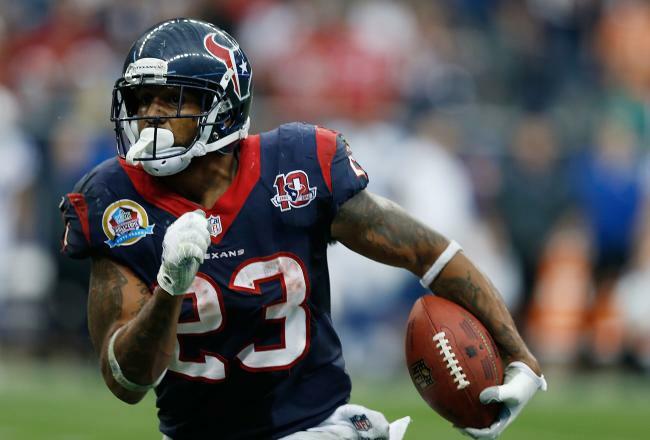 Forte finished 2014 as the fourth best fantasy running back. Forte is one of the most valuable backs in the league because he can come out of the back field to catch passes. Forte had 102 receptions, which was the most among running backs in 2014, while gaining just over 800 yards and crossing the pylon four times. I love Forte’s dual-threat ability, which is why I think he will be taken in the first round of most fantasy drafts. The best spot to grab Forte would be in the mid to end of the first round. The Green Bay Packers have arguably the best pocket passing quarterback in the league in Aaron Rodgers. 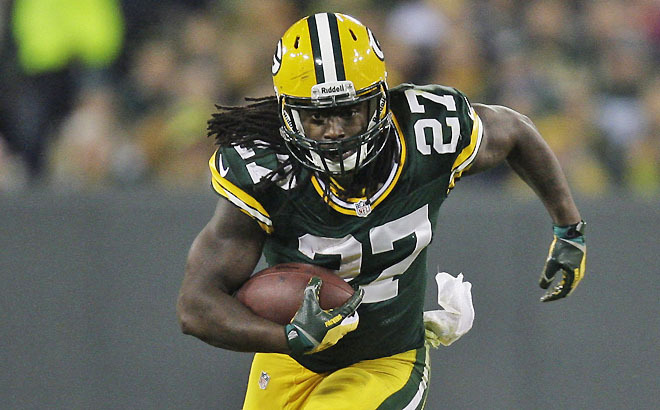 The Packers also have an underrated, Marshawn Lynch-esque running back in Eddie Lacy. Lacy is a big, bruising back who isn’t afraid of taking a hit. Lacy is just like the Seahawks running back Lynch, who plows defenders over. Lacy also has open field speed that he can use to outrun defenders. The Packers also have one of the most dynamic offenses because of their stud receiving core and Super Bowl winning quarterback. This is complimented perfectly by Lacy’s pure running style. He isn’t flashy like some backs try to be, but, instead, he just gets the job done. Lacy ranked sixth at the end of 2014 among running backs with over 1,100 yards and nine touchdowns. Lacy sees open lanes frequently in games because defenses are so worried about containing Rodgers’ arm, they forget about the big bruiser in the backfield. Lacy is most definitely going to be a first round draft pick once again in 2015, and I think he is a top six or seven pick. If Lacy is sitting there when you pick at sixth, seventh, or higher, take him, unless there is a higher ranked running back on my list available. The Seattle Seahawks are loaded with studs on both sides of the ball, which makes them a fantasy powerhouse. You can’t go wrong with any position on the Seahawks roster, especially at running back. 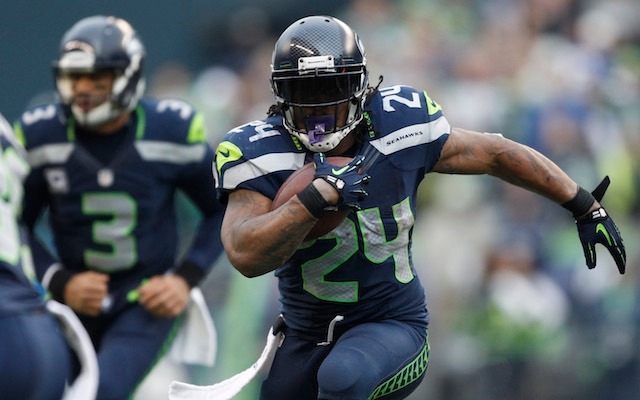 Marshawn Lynch is one of the most beastly runners in the league. He will trample anyone who comes in his path with ease. He just finds a way to rack up yards and get into the end zone. The Seahawks are able to run the ball down the throat of their opponents because of how talented their quarterback, Russell Wilson, is. Wilson is the playmaker who sets up everyone else on the team because he keeps the defense honest, which provides huge holes for Lynch to run through for big gains. Beast Mode scored the third most fantasy points among running backs in 2014, but he scored the most touchdowns, 13, at his position. Lynch is automatic when he gets inside the ten yard line. Lynch isn’t used much coming out of the back field to catch passes, but he did grab four touchdown passes from Wilson. Lynch makes up on the ground what he lacks through the air. Lynch needs to be drafted in the first round, and I believe he is a top five draft pick overall. I think that if Lynch is there when you pick at fifth or higher, you need to draft him. The Kansas City Chiefs look to overtake the Denver Broncos, who have been the dominant force in the AFC West in recent years. The most effective way to do that: give the ball to the best player on your team. 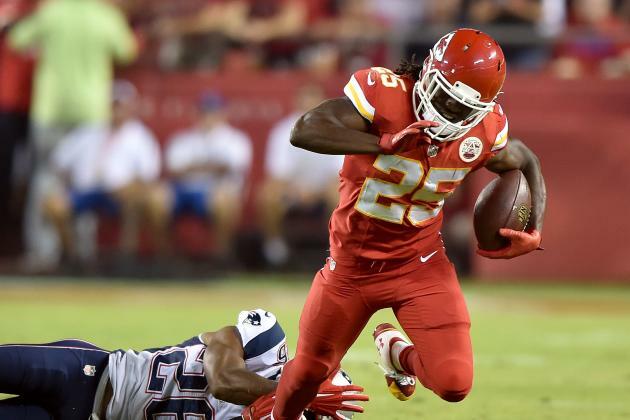 Jamal Charles is one of the most elusive running backs in the league, and he is deservedly a top ranked fantasy running back. He is the star of the Chiefs, and he is involved in almost every single play that the Chiefs make. Charles doesn’t have an All-Pro quarterback leading the offense, but Alex Smith is good enough to get the job done because he fits Andy Reid’s system. The Chiefs also have a solid defense that gives them extra possessions in games, which increases Charles’ fantasy value even more. Charles ranked seventh in 2014 in fantasy points among running backs, which is lower than his usual season totals. However, Charles was injured the second and third week of the season. Even with those two games he missed, he managed to rush for over 1,000 yards. Charles will be a top running back taken in 2015, and I think he needs to be taken at third overall. Charles is going to have a fantastic year, but I would prefer to have one of the other two guys on my list on my fantasy team. The Minnesota Vikings struck some bad luck last season, as Adrian Peterson was out for the entire season after a child abuse case he was involved in with his son. 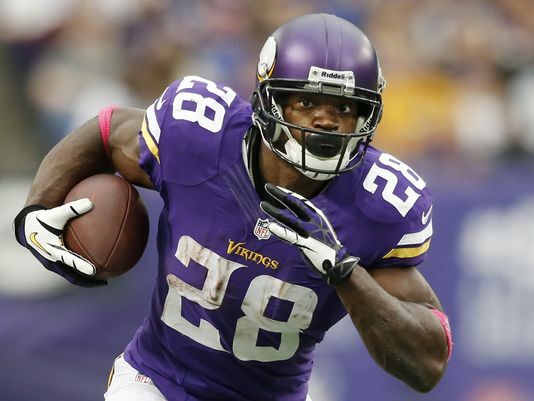 Peterson was a top running back heading into 2014, and he was going to be a huge part of the Vikings potential success. Peterson had some time off from football, which made him miss it all the more. Peterson is going to be led by a great young quarterback in Teddy Bridgewater. The Vikings also have some stud weapons at the wide receiver position, which should open up some lanes for Peterson. I am looking for Peterson to have the best season in his career because of the time he has had to sit on the sidelines. I realize that running backs tend to decline in their 30’s, but he will have fresh legs because he hasn’t played a game in almost a year. Plus, Peterson is one of the most vicious, bruising backs in the league. I would not be surprised at all if Peterson ends up leading the league in rushing. I could make an argument for Peterson to be the first overall pick, but I think that Peterson will not outscore my top pick in 2015. I would recommend taking him second, but he will be taken first in many fantasy drafts. The Pittsburgh Steelers are usually known for their stout defenses that instill fear in opposing teams, but things are starting to change in the steel city. The Steelers offense is beginning to become the staple of Steelers football that makes defenses tremble. Ben Roethlisberger is the catalyst of this new phenomenon in Pittsburgh because of his incredible evading and play-making ability. Big Ben also has some talented targets to throw to in Antonio Brown and Le’Veon Bell. Bell is one of the best receiving backs in the league, which makes his value absolutely skyrocket. Bell finished second in receptions among running backs only to Matt Forte. Bell is also a hard-nosed runner who isn’t afraid to take a hit. Bell knows how to hit holes, and how to create his own when there aren’t any. Bell finished second to DeMarco Murray in fantasy points among running backs. Bell totaled over 2,200 all-purpose yards along with a total of 11 touchdowns. I think that Bell is the best fantasy player available this year. However, some people don’t have him ranked first because he has a two game suspension for drug use. I realize he is suspended, but I still think he will be the top fantasy back and player this season.